Once upon a time, in a far away land, lived a little girl called Nhan. 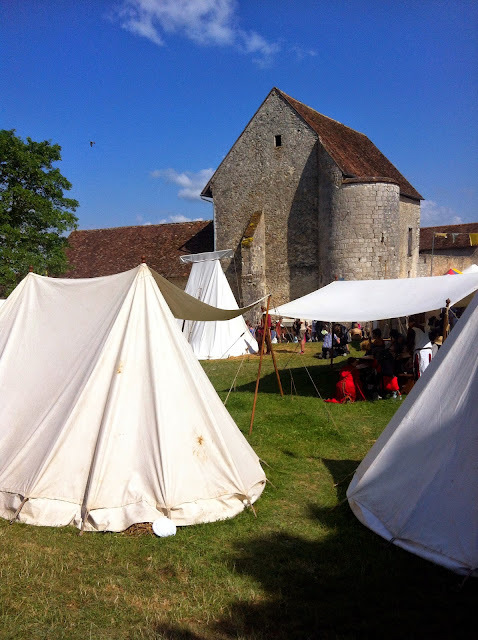 Nhan loved visiting places, especially old historic places that made her feel like she had travelled back in time. 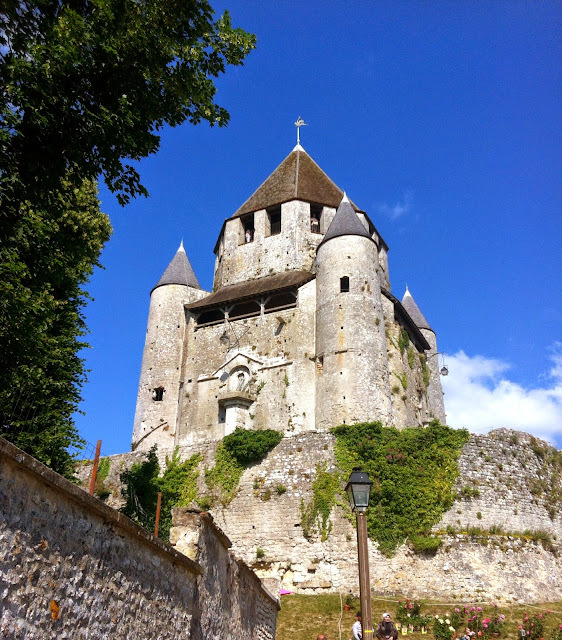 One day in the middle of Winter (about six months ago), Nhan decided to visit a little medieval town called Provins, known for its medieval buildings, ramparts, forts and houses from the Middle Ages. 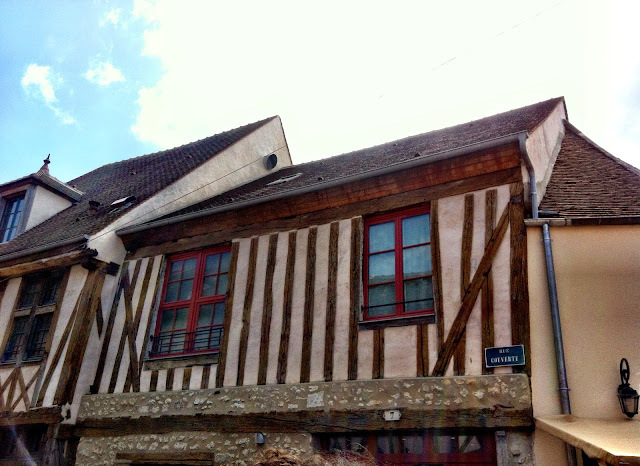 Fascinated by this quaint little town (but deterred by the French Winter), Nhan made a note to come back to visit again when it wasn't so cold. And medieval it was indeed. 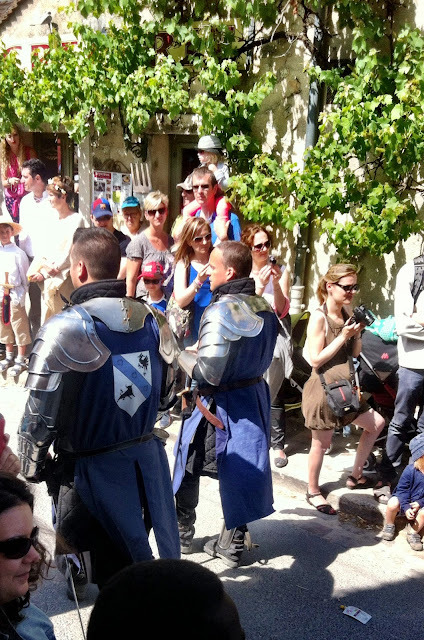 The town of Provins did a fantastic job at re-enacting the medieval ambiance during its 3 day festival. 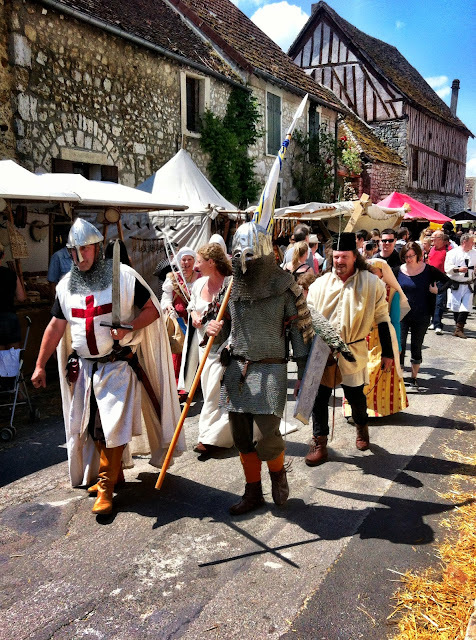 Bales of hay lay around the ground, knights in shining armour and damsels in distress (shhh to the feminist inside of me, let's just go along with this for the sake of the festival..) roamed the streets and there was a lot of hessian about. Clergymen? 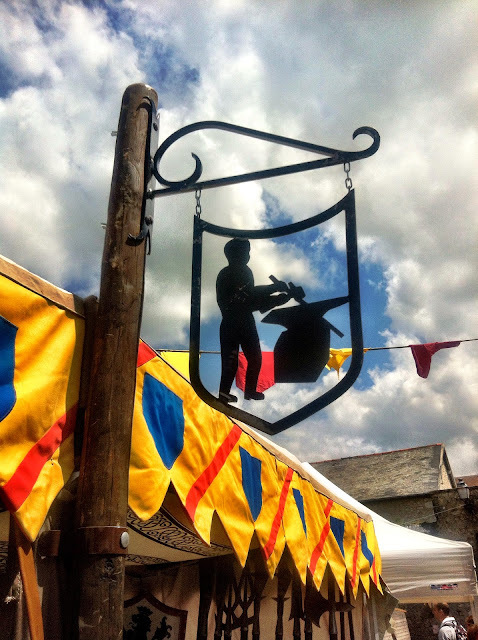 Dressed in hessian, speed signs were covered in hessian and bins and all things 21st century were covered in hessian to recreate the Middle Ages feel as convincingly as possible. All except for those.. iPhones haha. 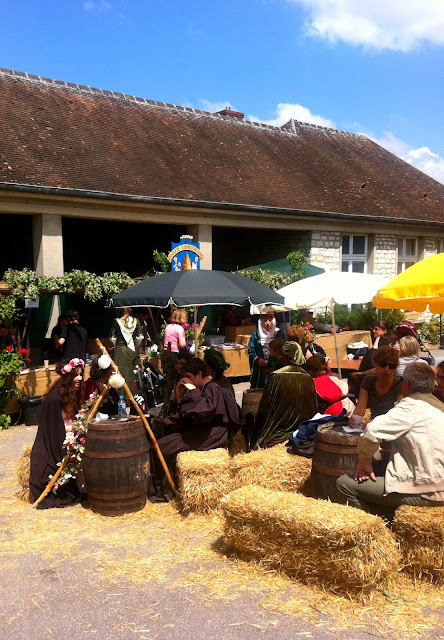 I was eavesdropping on a group of knights, peasants and ogres having lunch on some bales of hay when I noticed one of them speaking on his iPhone: "dépêches-toi!" (hurry up!) he said before he put his iphone away. It was a hilarious sight, if only I was brave enough to take a photo. Maybe, if there weren't any ogres at the table. So I took a photo of another table instead. 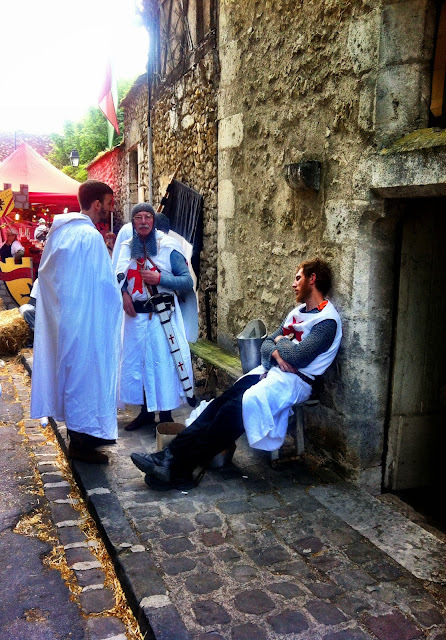 Here is a little journey through the medieval town of Provins that we recently went on to share. Being from such a young country like Australia, I couldn't help but be fascinated about this event (which basically means there are a LOT of photos - and these are the ones I had shortlisted!). After a one hour drive, we entered the village, found a free car park then walked towards the main entrance. 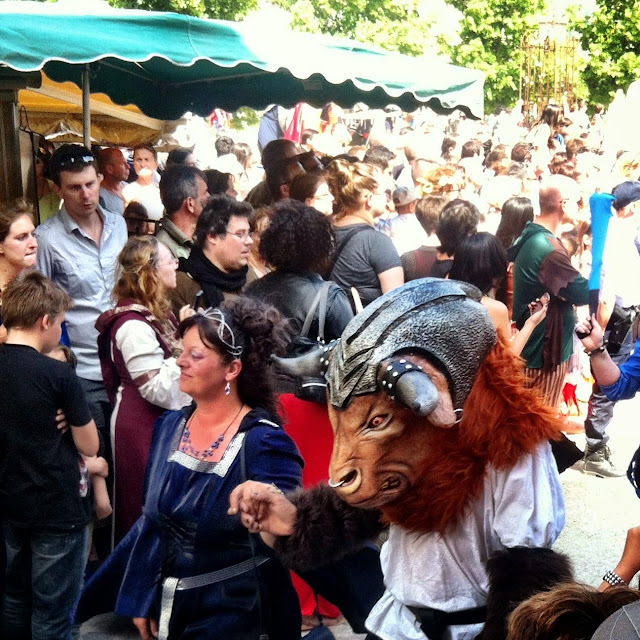 We paid the 10€ entry fee (it would have been 4.50€ if I arrived in costume damnit!) 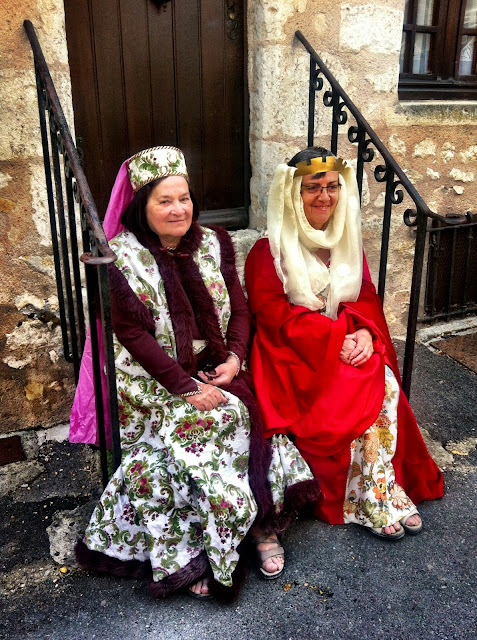 and instantly got into the medieval mood. 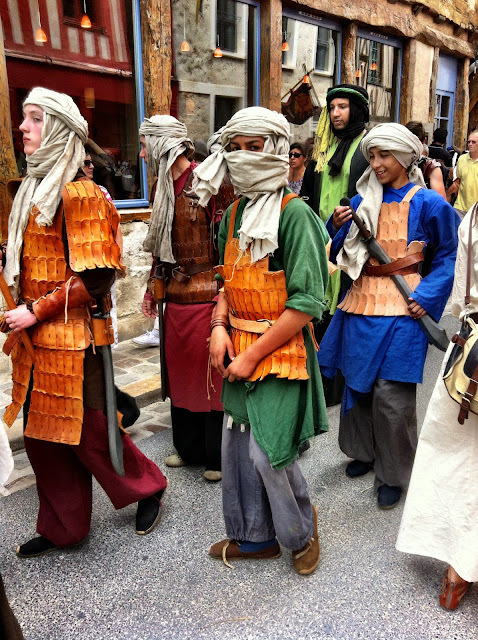 The town was set up with merchant stalls everywhere. The first one we saw was the blacksmith. Here he sold swords and other essential weaponry. 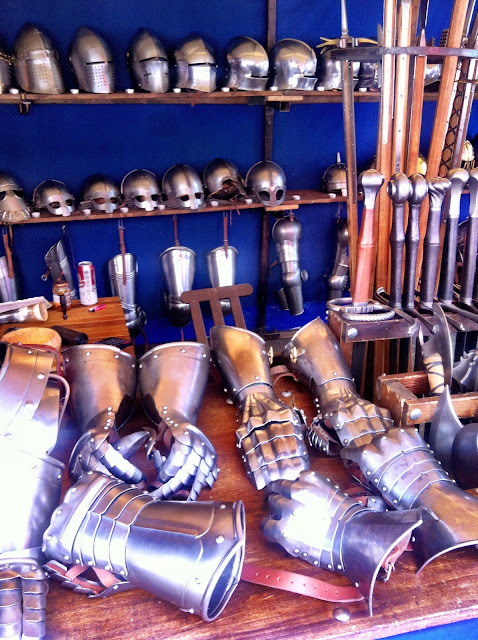 Across the road was another stall, selling everything and anything you would need to become a knight in shining armour. This guy below was fast asleep, although it looks like his friends hadn't noticed and were still talking to him..
We saw some lovely ladies of the court sitting on the steps. Obviously they were off duty and happy to pose! 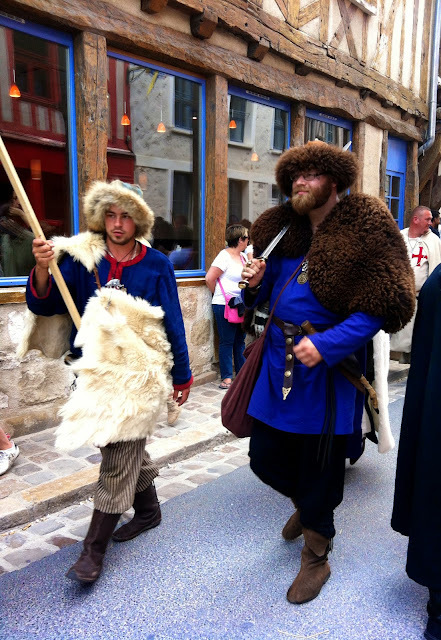 Roaming around the streets we saw more people from the Middle Ages. Just strollin' around. It was very cool. There were some frightening bandits too. As well as a matching Count and Countess. 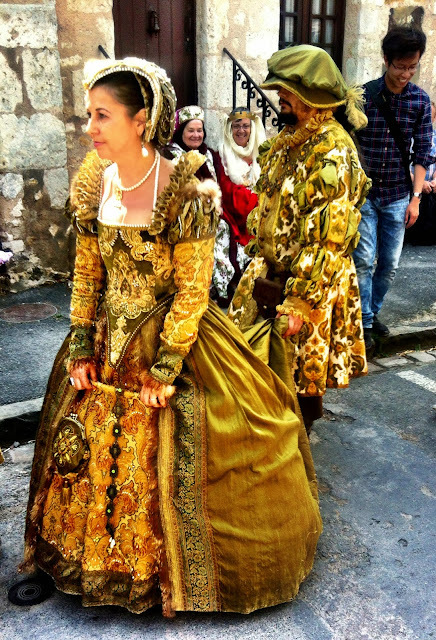 Poor guy had walk around town making sure the back of her dress didn't get dirty all day. A little more of a wander around town took us to where all the tents were pitched. 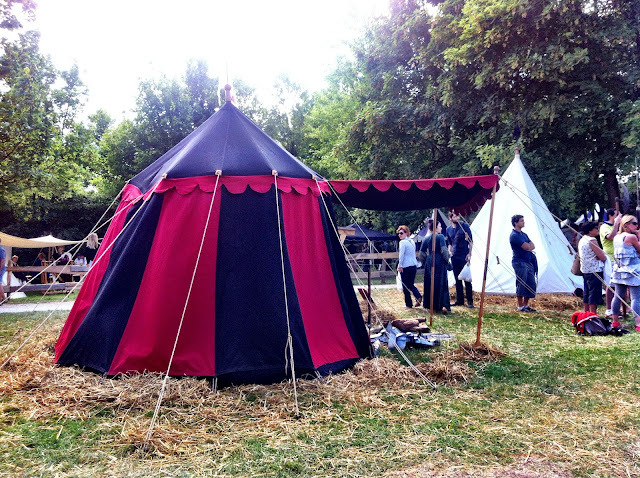 All sorts of interesting medieval activities were being hosted underneath these tents. 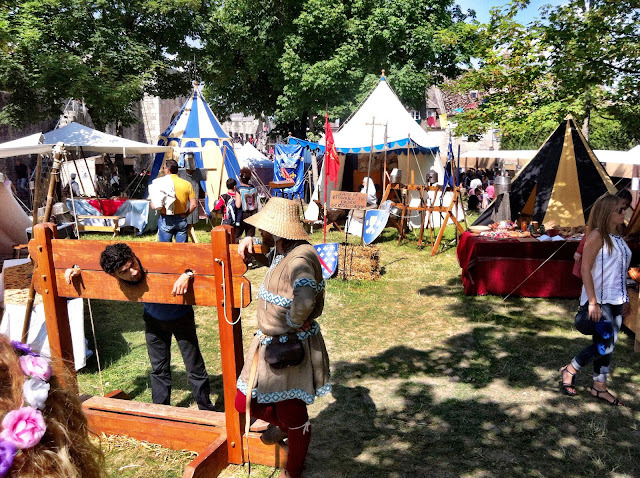 There was also a guillotine type structure to play with. 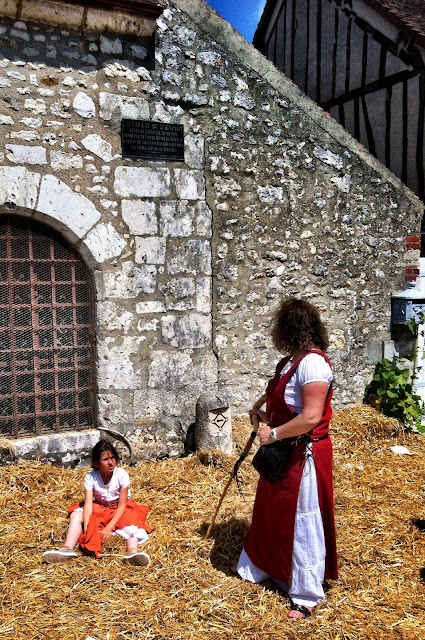 Apparently in the Middle Ages, prisoners would be kept in this position in the sun and rain days on end. They were given food and water but had to remain locked up, standing up. There was lots of quite reasonably priced food. 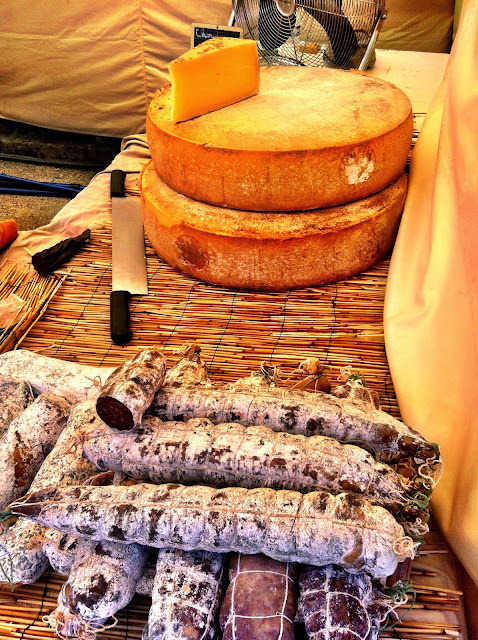 Cheese and saucisson was plentiful (as expected wherever you go in France!). 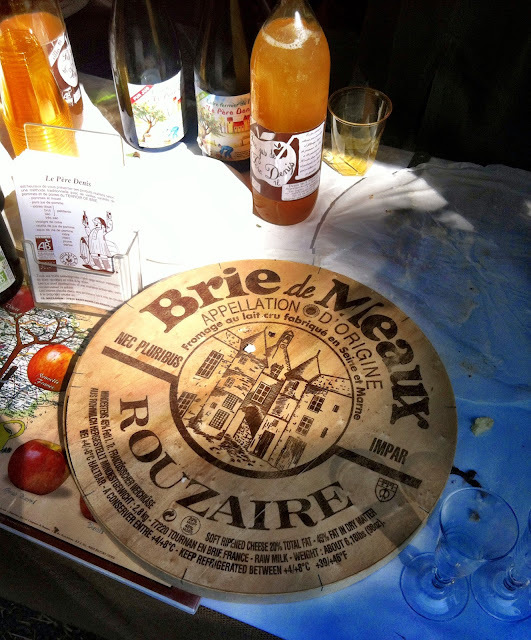 Ooh ooh and giant Brie (from the Meaux area in the Brie region). We tried lots of different snacks. 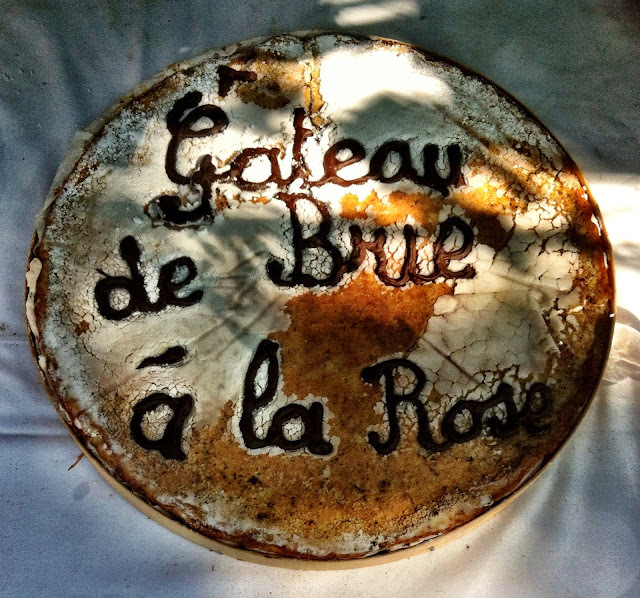 My favourite for the day was probably this home made "Rose Brie cake". A generous and deliciously subtle rose and fromage blanc (kind of a yoghurt/cream type thing) cream gently squooshed between two layers of hazelnut Genoise sponge. On top was a little icing and chocolate writing in typical "French" font. 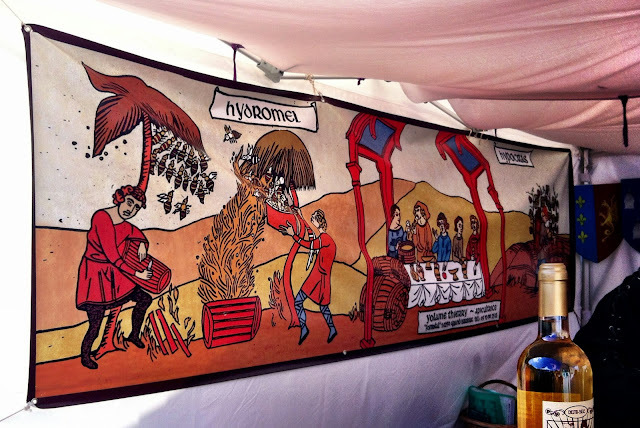 Oh and there was also a crêpe man from the Middle Ages. 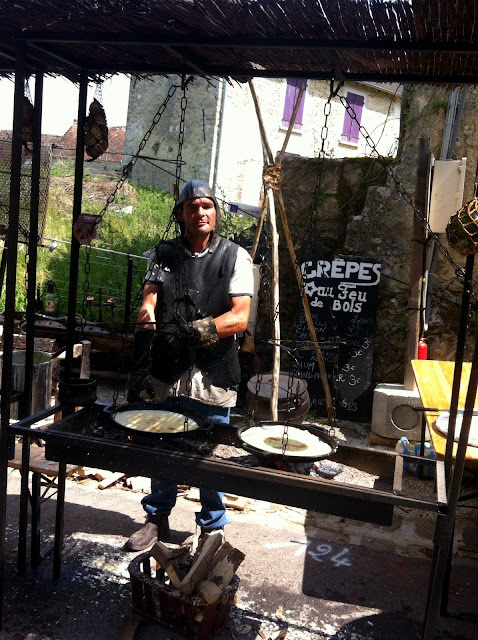 He used real flames to heat the suspended pans to make crêpes and galettes for us villagers. I was also able to try three types of wines typical to the region. Rose wine (hydropathe), honey wine (hydromel) and my favourite which was like a cold mulled wine (hypocras) - red wine with cinnamon, ginger and other spices but served chilled. 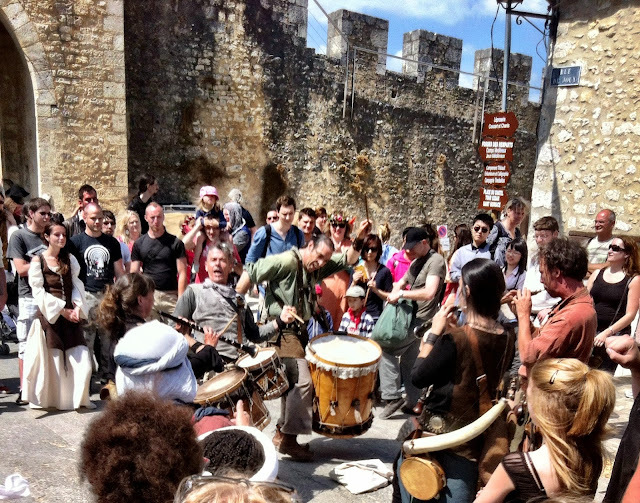 After eating, we saw some musical performances - it was such a cool experience hearing the medieval music against a backdrop of forts, ramparts and old Middle Ages architecture. The atmosphere was incredible. 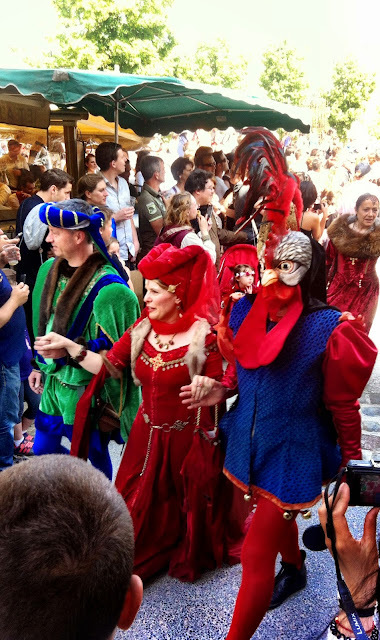 Next up was the official Medieval Parade throughout the streets. 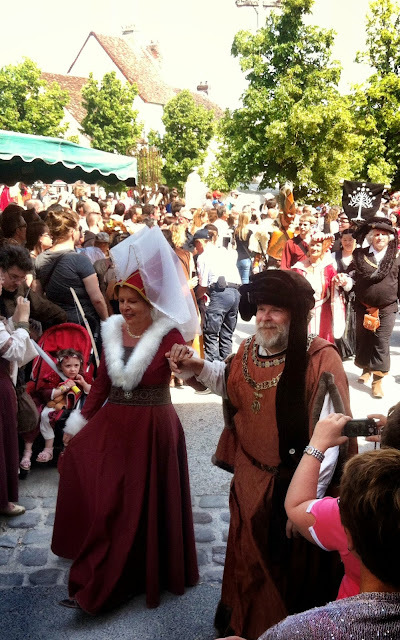 We saw kings and queens, princes and princesses, counts and countesses, knights and ogres, peasants, magicians, dragon-slayers, elves, even a group of lepers! 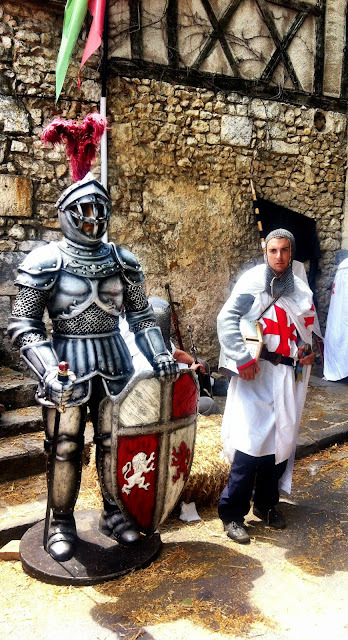 Anyone looking for their hipster knight in shining armour..? By the afternoon, some of us were getting a little tired. 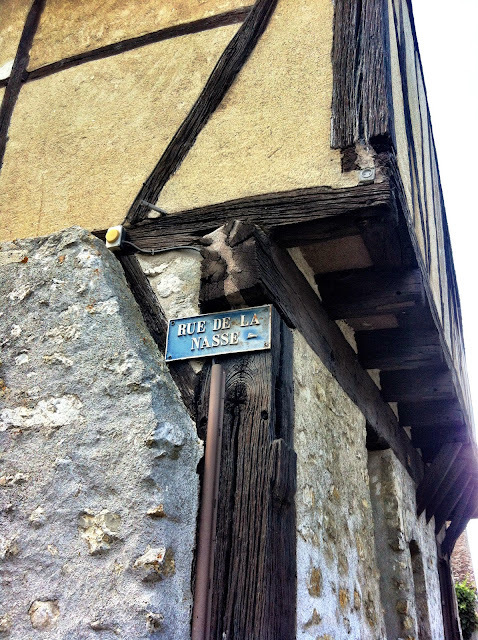 But we managed to do a quick final stroll to take in some the French Middle Ages architecture. 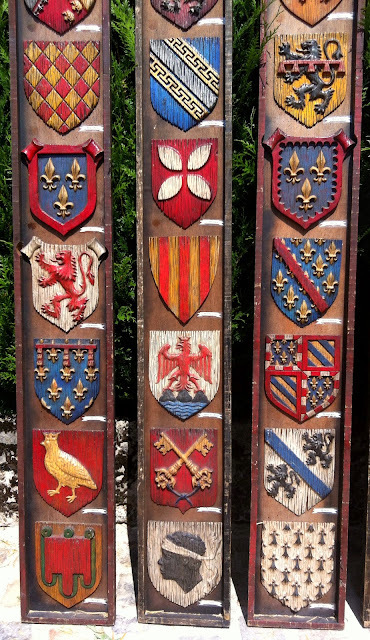 And also see the the French coat of arms from all the different regions of France. This next photo is one of my favourite photos from the day. I don't know why. 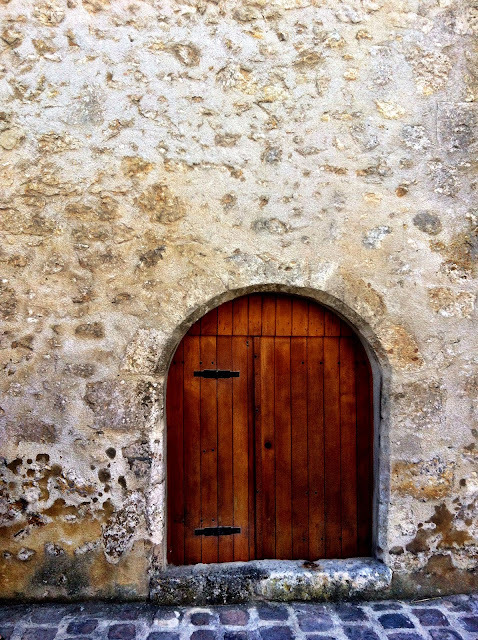 I just liked this mini door. And last but not least, here's a picture of the calligraphy I did from one of the activity stands. 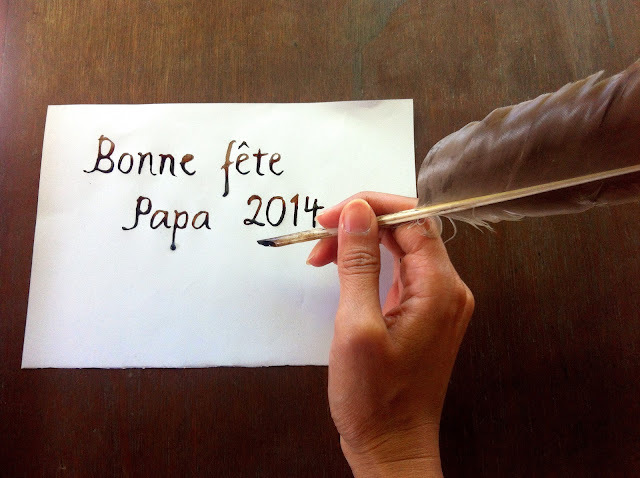 I wrote this with a real plume and real ink from a little pot as it was Father's Day in France that day. 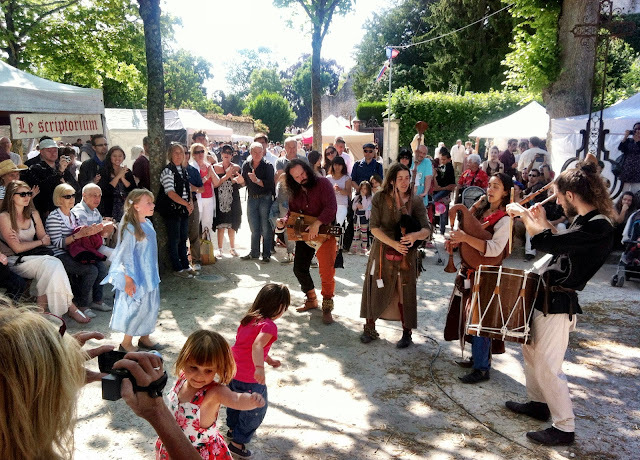 For more information click here to visit the official Provins Medieval Festival website. Next year's dates are already up!